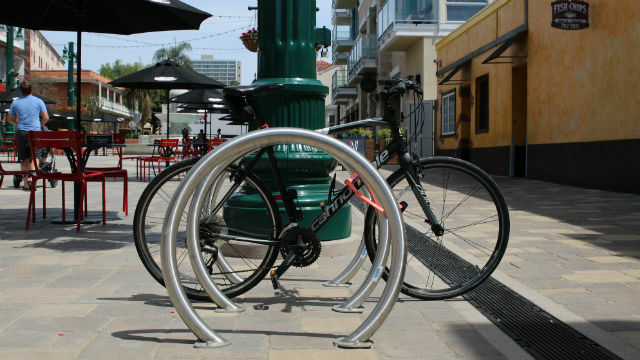 The city of San Diego announced plans Friday to install hundreds of bicycle racks across neighborhoods citywide. More than 50 racks have already been designated for downtown. Staff are seeking recommendations on additional rack locations via local Business Improvement Districts. The proposed downtown locations correspond with planned cycle tracks, also known as protected bike lanes, that will be installed to improve safety for cyclists in that area. The initiative, dubbed “BIDs to Bike Racks,” is a collaborative effort between the Mayor’s Office as well as city Economic Development and Transportation and Storm Water departments. Cyclists can locate existing racks in the city using the interactive map at sandiego.gov/transit-tuesday/bike.